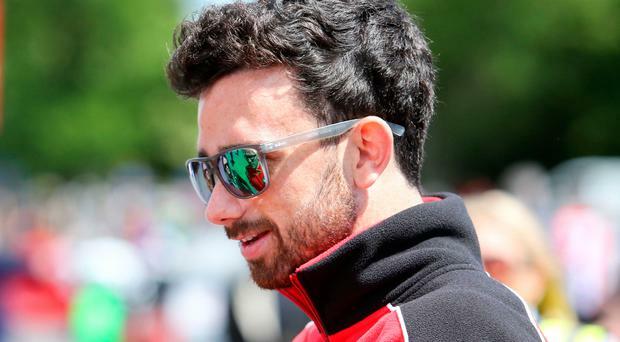 Reigning North West 200 champion Glenn Irwin says he'll be back next year but has revealed that 'anxiety' keeps him away from taking part in more road races. The Carrick rider instead has his gaze fixed firmly on following his close friend Jonathan Rea into the World Superbike series. Irwin won both Superbike races at the 2018 NW200 and also enjoyed a positive season in the British Superbike Championship, finishing third in the standings behind winner Leon Haslam and runner-up Jake Dixon. He ended the year in style, with his first race win of the BSB season in the final meeting at Brands Hatch last month. That was all on his Be Wiser Ducati but next year, a switch to join his pal Rea on the books at Kawasaki has been confirmed. Speaking after the British Superbike season finished at Brands Hatch, Irwin said he would bring his new bike to the NW200 in 2019, despite having his son Freddie at the forefront of his mind coming up to a road race. "We'll have a go at the North West and have a play there," he told Gavan Caldwell Bike Media. "We'll maybe add in some different classes but that's enough for me; one road race a year. "The anxiety I get the week before is horrible - looking at your little man thinking 'I shouldn't be doing this' but the buzz is class. "Mervyn (Whyte - NW 200 Event Director) has been really good to us. It's something I grew up watching. There's a special buzz in the air when I'm up there and it's too good to avoid." If the North West is a 'play' for Irwin, what's the real business? Well that's his long-held dream of success at World Superbike level. And he's confident his move to Kawasaki, where he will replace WSB-bound BSB champ Haslam, is the ideal move to fulfil those ambitions. "I was doing interviews earlier and people are asking about road races, 'are you going to do the TT?' but World Superbikes is all I want to get to," he said. "We are fast enough to go and do a good job in that series but a lot of it depends on the package. You can see with Eugene (Laverty - currently without a ride for the 2019 WSB series) at the minute - he's doing a great job for what he has underneath him. "Jonathan is showing an example of being the perfect rider on the perfect bike." If Irwin's big switch to the world stage is to happen, of course, he knows success at BSB level is a must. In a warning to his 2019 competitors, he confidently predicted race wins will become a regular occurence. "We'll keep working hard and hopefully we can earn the right to go to World Superbikes," he said. "That would be a dream but I need to concentrate on winning this Championship next year first of all. "(2018) was good. We finished the season third in the BSB which is not a bad achievement, especially when you know you didn't ride to your potential. My move for next year to Kawasaki is only going to unlock that. "To do what we did was good, especially with the double NW200 win. I would give myself a 7/10 - I'm probably being hard on myself but I want to be winning races every week and I believe that's what we're going to do next year." Irwin will once again join up with Jonathan Rea for pre-season training come the new year. If there's truth that your company determines your character, he's on the right lines to pick up that winning habit.